This basket was made by David using buff willow for the base, stakes (uprights) and most of the side with a little green willow (with bark attached, not artificially coloured) as an accent. 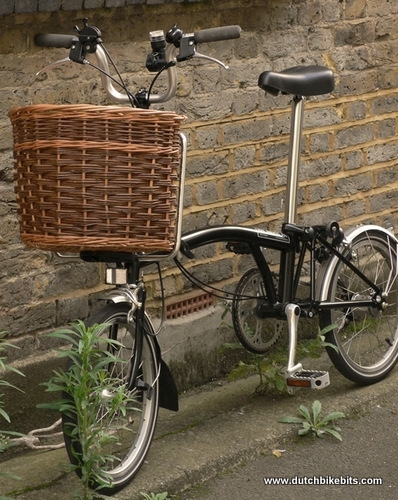 The size is correct to fit the normal size of Brompton front racks, used on most Brompton bicycles. 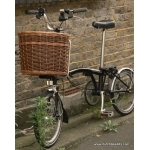 The basket is 40 cm wide and 30 cm tall to fit this type of front rack. S-type Bromptons have a shorter rack and this basket won't fit. 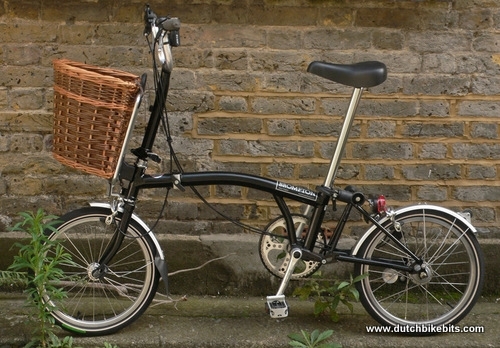 The Additional Images show more photos of the basket, including how it is attached to a Brompton rack. The pair of straps needed to do this are supplied with the basket, but the Brompton rack must be bought separately (we don't stock them). 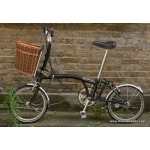 Note that the "additional photos" show a range of Brompton baskets in different colours. The basket you are ordering is as in the main photo, made of buff willow with a green stripe. If the basket is listed as in stock, then it can be delivered straight away. However, we've had problems in obtaining willow recently and sometimes it's difficult to find enough time to make baskets. If it says "30 days" there could be quite a delay. Exact colours vary because the baskets are made of natural materials.